What a cool specialty, Zulu. Your work is just beautiful and obviously requires years of practice and constant honing your skills. Great pics BTW. I'll bet you don't have any trouble w/ the neighbors when ya park one 'a those babies on the front lawn! And I'll wager ya get some suspicious looks from the local constabulary. The type of stuff that you make is very interesting. I would really like to see the process. We can see boxes, Router tables, jigs etc. on any forum. The really interesting stuff is the stuff you don't see everyday. ZULU: Welcome! Very interesting stuff. To scale? It's been a while since I've looked but where do you get the square nuts for your bolts? Those cannons are fantastic. I especially like how you make wood look so much like chain. No, really, they look awesome. Its always nice to see something different and your work certainly falls into that category for me. Nice job. All I can say is it looks like you have a blast at your work. That is some great work just finding the infromation would be work on its own. DOUBLE WOW. They look so real, one has to know that you are a woodworker to know they are not. Great work, your intricate detail is overpowering..
BTW, welcome home, we had a place for ya, glad you found it. My father was my Mentor for my WW hobby. luv ya dad. Wow! That is unbelievable! I can't imagine how many hours you have in it. By the way, Welcome Home! We've been waiting for you! Welcome!!! Fantastic work! Great web site. You'll love it here. Zulu, those things are slicker than butter on a bald monkey. Newtooth, I get square nuts at the local hardware store. They are a little pricey but add to the illusion nicely. I have been an artillery nut since child hood. I have a nice library of cannon books including re-published military drawings of many different kinds of cannons. I try to be as accurate as I can with every gun I make. Here is the one I have the most hours in. The barrel is a real reproduction and can be fired. I have all the hours in the carriage. I built the wheels and did all the metal work. It is a 3/4 scale Revalutionary War style split carriage cannon. The barrel is 36" long and the wheels are 36" tall. The carriage is about 6 1/2' long. It sits in my foyer just inside the front doors to greet any visitors. Zulu, Great looking work. The detail is fantastic. What HO !! Warning shot off the starboard bow!! Stand by to repel all boarders,.. belay pins ready!,... General quarters all personnel. Oh wait a minute - I thought I was on another forum there for a second. Jumin' H. Jehoshaphat!! If I hadn't seen that with my own eyes,.. Thank you for posting the progress photos. Welcome aboard and as already been hinted - we never get tired of pics around here. How I built a wheel. A cannon wheel is supposed to be "dished". That means that the spokes have a 3 degree cant on both ends. The cant is opposing on each end. When assembled, The part of the wheel that touches the ground does so at 90 degrees. The top of the wheel then cants out at 6 degrees. This makes the wheel stronger when cornering. Since I couldn't figure out how to get opposite 3 degree cants on the ends of my spokes with a power tool, I just made the wheel flat (no cant). Does anyone have any experience with making wheels? I'd love to hear how you do it. I would think a disk large enough in diameter to hold the spoke at 3* at the required spoke length would be enough of a jig for this operation. The disk diameter would depend on the spoke length as a longer spoke will require a larger disk. Really long spokes will require a lathe which will turn large diameters. The disk would need a "hole" the same diameter as the spoke tenon after turning. And, it would need a 3* "wedge" opposite the hole. Both the hole and the wedge would need 2 "pins" to secure the spoke during turning so it doesn't rotate relative to the jig. The drive spur "should" prevent this, but additional security is better than blind trust. You could make the jig adjustable by having the wedge and hole be "sliding" and a "locking mechanism" to keep it secure while turning but that adds complexity you may not need. The jig would need to be a live-center type as it will need to rotate at lathe speeds. Put the square spoke stock in the lathe and turn to final diameter as normal without reducing for the spindle ends. Put the jig onto the lathe tailstock and put the turned spoke onto the wedge pins. Turn one spindle end. Then reverse the spoke and put the turned spindle end into the hole. 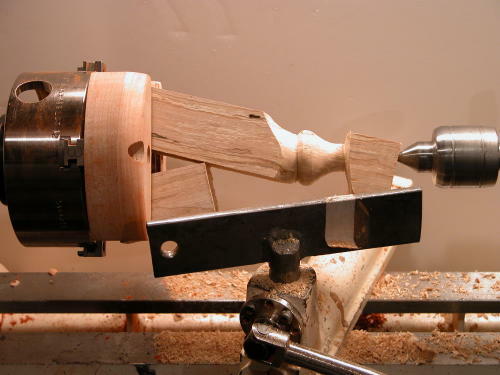 Turn the other spindle end after marking for length between tenons. Each spoke will have a tenon that is offset by 3*. Thanks for the reply. I think what you are describing goes beyond my skill level. I got a little lost in the description. Obviously you have done something like this before. Have you ever made a wheel? If you post there I'm positive that you'll get pictures on how to offset turn spindles for dished wheels. However, to help you visualize what I'm saying, bend a wire into a "Z" form that would mimic your 3* offset spoke. Now, holding only one end, roll the wire with your fingers and observe that the free end describes a circle. IF your fingers were the drive spur on the lathe, the free end would need to be secured at the tailstock somehow. IF you poked the free end of the wire through a hole in a wooden disk it would hold the free end securely while you turned the end of the spindle where your fingers are holding it. Alternatively if you don't have a ball-bearing tailstock, you can reverse the whole shebang and turn the spindle end at the tailstock and use the disk to drive the spoke. Either way works. I did some google search on this. My verbage is wrong. the correct term is "eccentric woodturning". You can see that the turned part is at an angle to the axis of the blank. If the turned part were the spindle end that fits into the felloe or hub and another one turned on the opposite end, the wheel would be dished. Excellent information! Thanks for the pic. I now can understand what you were trying to describe.. I'll check out the website. RRRRRRRRRRRRRRRRRRR! Sorry to be so late in me 'Welcome Aboard' thar mate. Just got back in from an extended pillag,,,,uh,,,er,,,voyage up north. Yeah, that's it, just a little voyage. RRRRRRRRRRRRRRR! So a hearty welcome aboard Mate! We could use a good armorer! Now, about them 6 pounders, just how many could ye get me before my next, er, voyage?" "What's that?!?! They don't actually fire?!?! Perhaps we could just use them for imtimidation. Somethings better than nothing I always say." "Again, welcome mate, ye do some mighty fine work and I'll be happy to, uh, voyage with ye any time. RRRRRRRRRRRRRRRRRRRRR!" Great work, amazing finishes, stunning pic's and I hope to see more of your work soon.